Here's a little sneak peek before I show a few before photos. This was our original dining room (also referred to as the toll booth). It was long and narrow with a single homemade bay window. 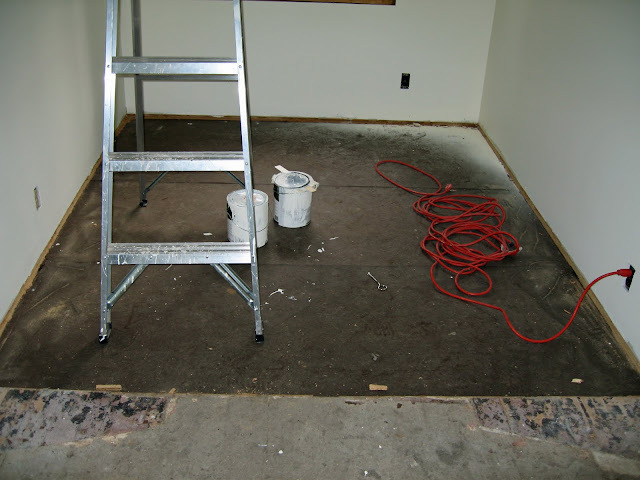 Unfortunately, this is the only before picture I have of the original room. It measured about 6 feet by 10 feet. This is before picture #2. The new structure was reconfigured to 12 ' x 16' and french doors were added at the transition between the kitchen and new dining room. Shortly after completing this round of renovations (which was two years ago now), we knew that we should have put windows on the east wall instead of the dining cabinet (there wasn't room for both). Luckily, we had the foresight to have the contractors put a header in that wall so that we could opt for windows down the road......good thing. We recently added those two new windows on the east wall, which lends a whole new feeling to the room. As you can see, the dining cabinet no longer fit, so instead we hung a nice long mirror. 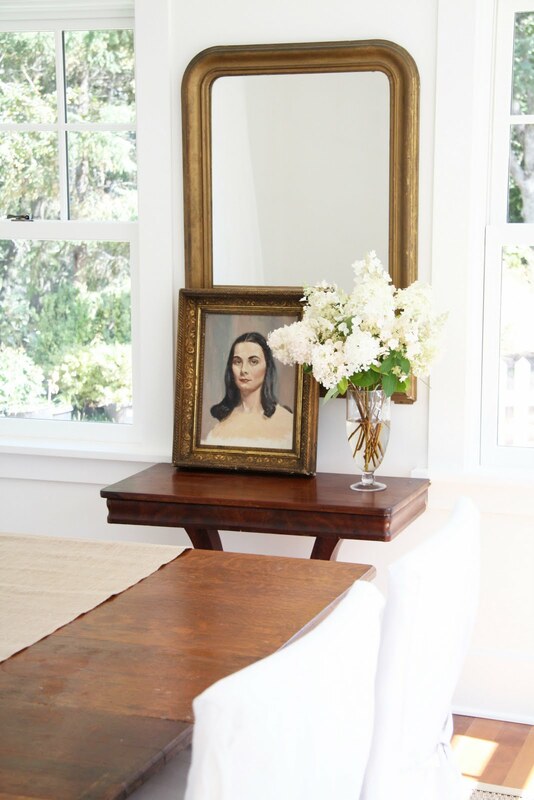 The antique table is a family piece from my Grandmother's house that I grew up with. It isn't what I would have typically chosen for this room but it has sentimental value and it really is a beautiful piece. We added two leaves to create a farmhouse style feel rather than the square we originally set up. To create a less cluttered and more open feel, I decided to place chairs on two sides rather than all four. And to lighten the weight of the table, and because I really love the look of Parson chairs, I found slipcovers to fit over the armless dining chairs we had up in the guest house. This was the cheapest way I could attain the Parson chair look without the $500 plus price tag. We also added a sea grass rug (relocated from the living room as it was too small for that space). I also decided to add curtain sheers to frame the french doors going out to the dining patio. Because most of the wall space in this room is either windows or french doors, there isn't much space to hang art work. So I decided to lean a piece up against the mirror as I love art in rooms that isn't expected. To learn more about the portrait, go here. I kept the walls white because I really wanted the room to feel light and fresh. I also wanted the outside to come in so I didn't want colors to distract from that. I'll accent with different things to transition through the seasons (fall decorating is so close!). Everything else we repurposed from other rooms. I've included our expenses because an important part of my design philosophy has always been to decorate within a reasonable budget. In this case, we had already spent a lot of money on the new windows, so my goal was to be as creative as possible for the least cost. I hope that you like our 'new' dining room! Your dining room is stunning. It's so light and airy and really tastefully decorated - your home should be in an interiors book. It's beautiful. Love the new chandelier! This is absolutely gorgeous. :) I just love your style, Trina. Just stunning. Hope enjoy many wonderful dinners in this room. It is beautiful!! I just love it. Your dining room looks stunning!!! The new windows on the eastern side let in so much light. You have done such a great job....I have been wondering how it's all been going, so thanks for sharing!! really, really beautiful. It looks so serene and calm. now lets see the nursery!!!! It is beautiful! I love all the of the natural light that shines in and by keeping the interior simple you truly do enjoy the outdoor scenery just beyond the windows and doors. Light from three sides...perfection! 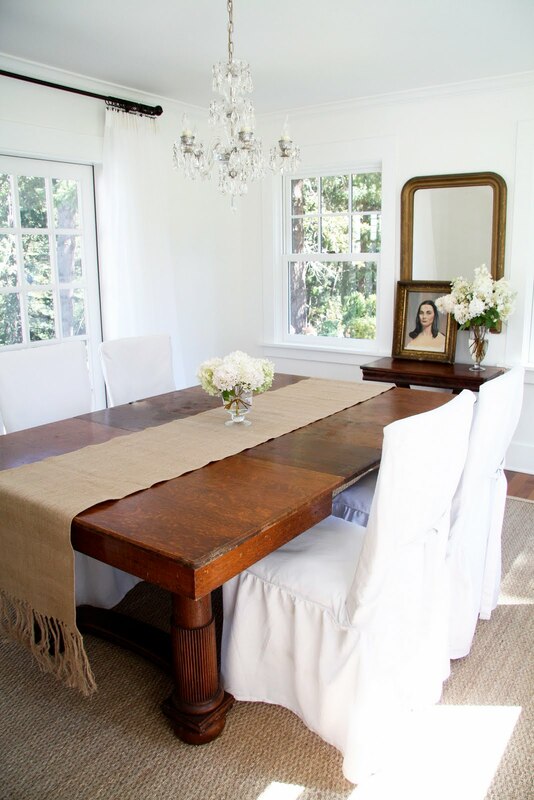 I love the linen runner down the dining room table, and I love the antique table. It grounds the room and adds staying power to the design. The sheers soften the effect. And the long mirror is the crowning touch. Well done. I've been waiting for this post as you worked. Now I await a darling nursery for two or two nurseries. Which will it be? It's as beautiful as I thought it would be. I love the windows. You are very talented. Enjoy!!! How beautiful, I just love it! The white just makes it all look stunning!!! Love all those windows! How beautiful! I love it. A study in less is more. wihat time is supper at the country farmhouse? Gorgeous! I love all the light. My house was built in the 1930's, so all the rooms are pretty closed off from each other. I would love an open, airy dining room. Oh I just love it! Thank you for sharing! Absolutely gorgeous!! I love the table, it gives such a grand look yet the slip covered chairs give it a comfy home feel. 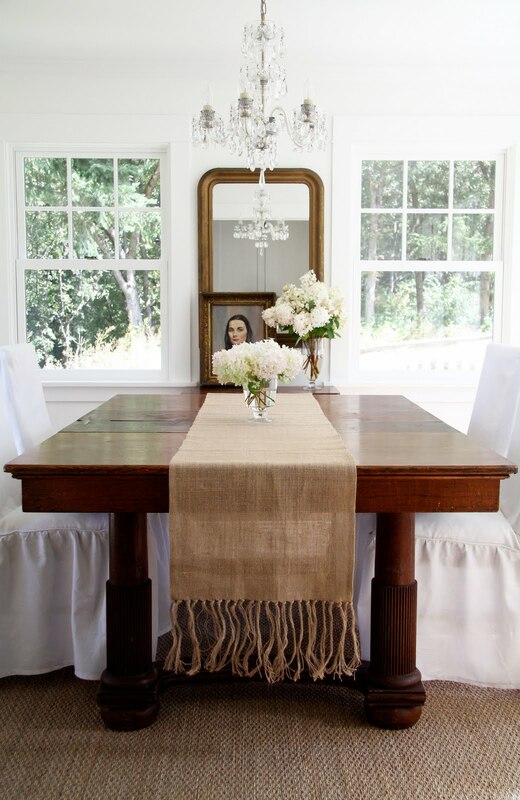 The table runner is divine and completes the look. A beautiful room and so much light. Gorgeous, love the burlap? table runner! I love the transformation. It is just absolutely swoon-worthy. Looks like the perfect place to enjoy one of your fabulous meals! Now I'm curious how your living room changed without the rug and the painting. As always, it is such a joy to read your blog. What a beautiful room! You must be so happy with how it turned out. It is beautiful! It is wonderful that you were able to create such a warm and inviting space without spending tons of money. Well done! Wow! Your dining room is beautiful!! Being fond of an all white room, I think it looks perfect! OOOOh, I love it! It made all the difference in that room. You have inspired me! It looks great! I love the feel of the room with the windows added. So airy and fresh! Really nice. Beautiful ... like eating in a conservatory. Love the table with the four chairs ... keeps the room light and airy. Wow! It was beautiful before - but it's stunning now! Who'd think that two windows would makesuch a vast difference? Oh its beautiful! Love how light and airy it is! Ya'll did a great job! Another home run! It's all so beautiful. I always love how you include cherished pieces. A few months ago I bought one of these same slip covers(on sale because the package was opened/damaged) to try out on a desk chair. I haven't done it yet...because I hate to iron! Shameful, but now you have motivated me!!! I think I would spend all my time in this beautiful room. The light is amazing and the windows and doors are gorgeous! I have been waiting and waiting for this post and I don't know what to say without sounding over the top jealous but it is absolutely BEAUTIFUL! Honestly, this is the most gorgeous room I have ever seen. The first thing I noticed besides that stunning table and all the light is the beautiful (wish there was another word to use) view from all the windows. I can just imagine how it's going to look in the fall or the winter with the snow falling. You did an amazing job on this project! What beautiful light you get in your dining room! I think it looks gorgeous! You did a wonderful job! Beautiful. beautiful! and although the room already had so much light, it's even better now. nicely done. have you ever shared a floorplan of your entire home, to show how each room is laid out and flows into each other? i would love to see one. Just beautiful and those windows were a smart investment, making everything else bright and able to stand out! I love your info on the particulars, so nice of you to share that with us. I'll have to check out those slipcovers! I love how bright it is. I am always hoping for more natural light. This is magazine material!! Beautiful in every way. I have never loved white as much as this, and with the brown of the wood, and all those windows. This is my dream dining room! Your home is simply beautiful. You have wonderful taste! What a difference you've made to the dining room...I can't believe that the room was even considered a dining room as it was too narrow for a regular table! The room was beautiful after your first renovation but the windows have taken it to a whole new level. JUST GORGEOUS! I knew it would look good as you have done such a wonderful job of renovating and decorating the rest of the house. What an incredible room to enjoy good company good food and a beautiful view. Enjoy your new room...relax and enjoy the season as you wait for your precious babies to arrive. We look forward to your next 'reveal'! Have a wonderful day. 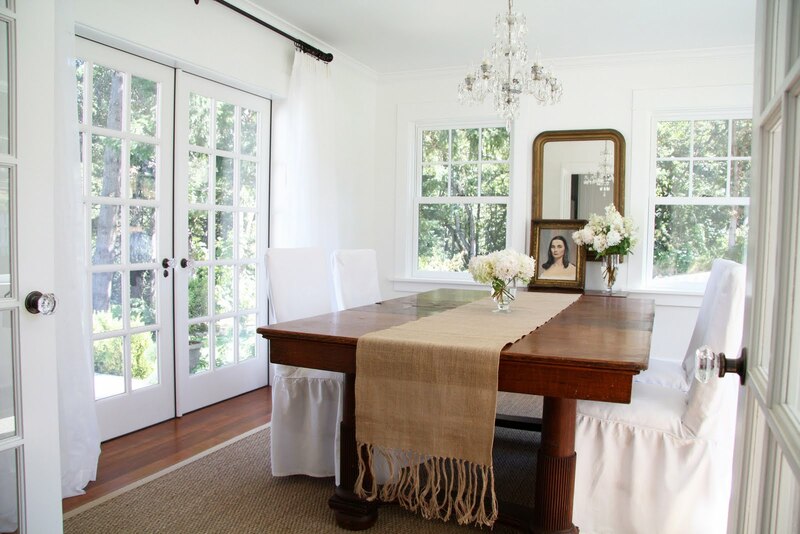 I love how fresh & airy your new dining room is! Can't have enough windows in a room! I really appreciate your sharing where you purchased your items and for how much. I find it really helpful and encourageing. I'm more likely to give those stores a chance after seeing how nicely your room turned out. I love warm color of the dining room table. So glad you kept that. Your home is beautiful. You are living my dream! 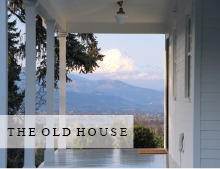 :) One day I'd love to buy an old farm house in the country, fix it us, raise my children, ... one day! Thanks Trina for sharing your lovely place with me. It's inspiring for the future. Hi Kristen - The runner is burlap and I picked it up on sale ($19.99) at Pottery Barn a few years ago. It was a little long for the square set-up but fits the table perfectly with the added leaves. Maurie - We're converting our guest room downstairs into the nursery. So part of the design for the nursery is to use space wisely as the room is small! Gorgeous! I love all the light. When is the 1st dinner party so I can pencil in on my calender....haha. I love the weight of the polished timber of the table and mirror frame with the lightness and brightness of the curtains and the windows. Simply stunning! Trina, this is lovely! Exactly what I'm aiming for! I'm almost there - the room has been painted, the table in place, and I have the curtains and rod - just need to get my rug and chairs. I'm working with a piano in the room, but I was thinking a mirror above it would be perfect to reflect the light coming in from the windows. Can I ask where you got the burlap table runner? I've been searching for one similar to yours even before I read this post. By the way, the two new windows were worth it! Lots of bang for the buck if you ask me! it's so pretty! I love the natural light. Great job you guys! GORGEOUS! I want you to come decorate my house! Beautifully simple and so in keeping with the rest of your gorgeous house. ok, i for one have run out of words for you. seriously i have. i'm gonna have to start inventing new ones. i agree with everyone above me and i'm sure all that will be below me. i'm going to have to go buy a new thesaurus. but before i do, how's this...aweinducingchillsrunupmyspineperfection. I love it and I bet you do, too! I would find myself just standing there taking it all in, or perhaps sitting at that beautiful table! I believe the nursery should be up next. I can't wait! Your dining room is stunning, Trina! All that natural light is beautiful, too! As usual, simple and beautiful perfection. The fact that it's inexpensive just underscores how perfect. Very pretty! I've always preferred having 2 chairs on either side, rather than all around the table, too. absolutely stunning. 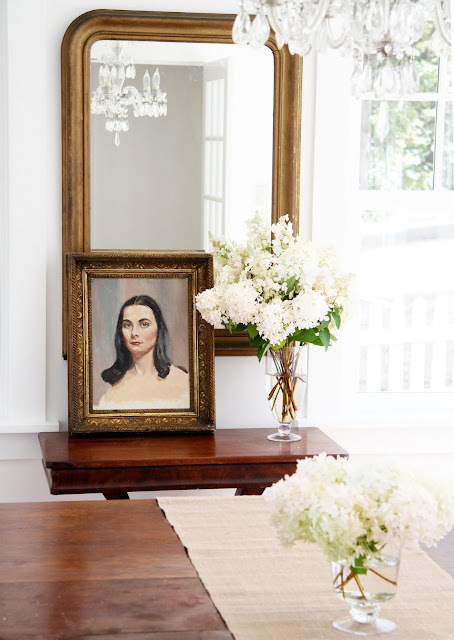 layering the painting over the mirror is just the perfect touch. Gorgeous! Love all that natural light. 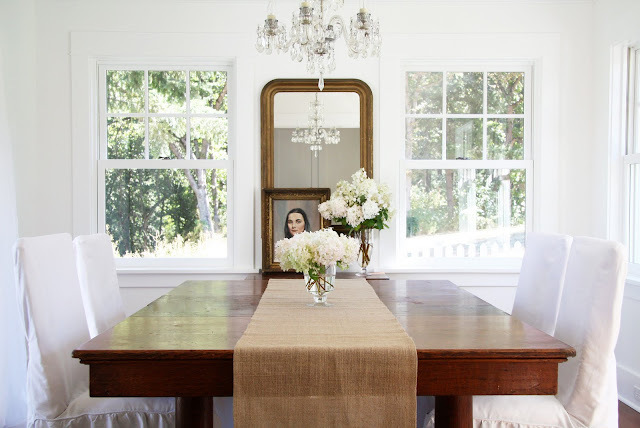 What an absolutely beautiful dining room... and on a budget! I wish you could work your magic on my home. Hi Trina! 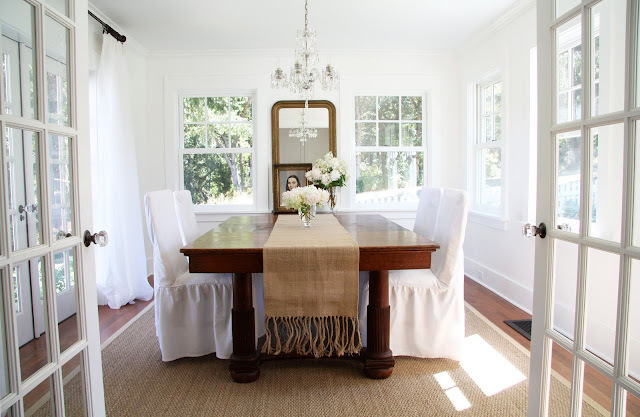 Love your dining room renovation, it's so full of light and airy. Also like furniture pieces that have history behind them, bet you love hosting gatherings in your grandma's table. And props for the artwork resting on the mirror, very unique. Wow beautiful! And I love love love love how that one simple portrait added a sense of mystique to a simple but sophisticated airy white room/space. Your room looks AMAZING! I love all the windows, and the clean simple elegance of the room. Is this your dining room or does it also serve as your breakfast room? It is so beautiful - I would want to have every meal being surrounded by the outdoors. You did an amazing job with a very small budget. What a beautiful room! I was excited when I saw the title on my sidebar of my blog. Everything looks so fresh and light. I love it. Tell your hubby...great job on the renovating...and you...great job on the decorating! Can't wait to see what you do this Fall! Question...how did you add the table leaf? Did your hubby make one to fit in, or did you already have the leaves? Hope you are doing and feeling well. Wow, that is one pretty room. I love the table and the fact that it is an heirloom is even better. Love the mirror and the picture leaning... I want to go back and look again. I really love the space. The windows are fantastic! The leaves are original to the table. BUT I was really shocked that they fit so seamlessly because I know that leaves often warp. So we were pleasantly surprised! Very beautiful. I love the casual elegance. The tomato crop is beautiful as are the blueberries & pickles...thank goodness you have such a healthy bounty this season. This dining room is absolutely beautiful. Casual, elegant and ready to give you many wonderful memories. The days are changing aren't they? I'm enjoying a sweater around my shoulders tonight. SOOOOO beautiful!! Thank you for sharing the $$ details - - that is so helpful. It looks incredibly lovely and I really love the way the chandelier is reflected in the mirror, and the casual propping of the portrait. Don't those new windows make an extraordinary difference. Just gorgeous. Simple and elegant. I saw this post last night Trina & couldn't comment, I was too awestruck. Gosh you 2 are amazing, the vision & stamina you have for that beautiful house continues to blow me away. BEAUTIFUL! So light, airy, and I love the hint of color from your painting. Beautiful and cozy! Congrats and great work! Good post on this dining room renovation. 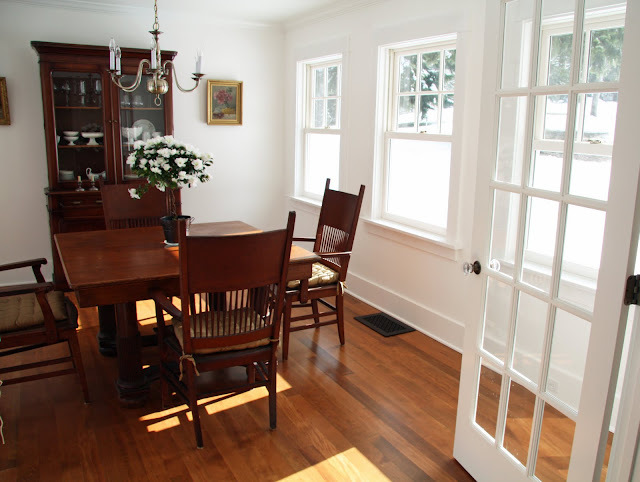 Adding the country-styled dining room set seems to be attractive given the hardwood floors. Thanks for sharing. The windows made a real difference and look wonderful. Good job! I just hope you found a nice spot for that great hutch. I loved it too! This room is wonderful, it looks like a garden setting, so pretty! Beautiful! And that portrait is compelling to say the least! Just beautiful... and dreamy. I really like how you use such dark and sometime heavy looking furniture but with all the white and light it comes out looking fantastic. Oh my, you have outdone yourself with this one! I love your new dining room, it's so bright and beautiful. And thanks so much for telling me about those chair slipcovers, I have been wanting some, but the outrageous prices have kept me from moving forward. I will be heading to Target tomorrow to see if I can find some! You did a wonderful job and you must be so excited about how it all turned out! So Beautiful. I have to say I am very envious of the amazing light you get, and how wonderful it must be to step out through those french doors on to your outdoor dining patio! Lillie said: If you cook as good as you decorate I am coming to your house to dine. Love every little detail of your dining room BEAUTIFUL!!!!!!!!! Trina, your style is absolutely beautiful. I love the addition of the new windows...so light and airy! Beautiful! Your dining room is gorgeous! I absolutely LOVE your grandma's table. It's so special you have furniture that's been in your family for a long time. You've created a perfect room! I love the before and the after. Absolutely lovely, the wonderful whites, and that wonderful table. Oh my gosh it it so beautiful!!! I am in love with it!!! (and everything you touch for that matter!) But i love the mirror and your artwork is perfection as always. Such a classic, simple & beautiful space. Those windows make such a difference! I love all the additional light. Beautiful! How did I miss this post?!! It turned out beautifully Trina and your chandelier is the perfect fit. Bravo!! Lovely Lovely Lovely! This room makes me very happy! What a huge difference two windows can make! You have a very fresh eye. Congrats on the baby girl and baby boy! Wonderful life wonderful day! Trina...The room looks wonderful....may I ask re the chandelier..where it came from? I had been looking for one for awhile and the price was right (I think it was around $250). Dear Trina, I saw this picture at Mrs. French which immediately reminded me of your dining room! love your blog so much...i am posting a link on mine! keep sharing...you have great taste! I like how you made it feel more open and less cluttered. Thanks for sharing.